One Room Challenge: Final Reveal-Fashionably Late, but oh so Fabulous! My son's old bedroom, you can hear me cringing...only 6 weeks ago! Do you remember the Mood/Inspiration Board? Are you sitting down?? You are going to need to take a deep breath. A cozy little nook, I had the green artwork previously in my dining room and it fits nicely in this space. What's that fabulous mural? My daughter is an artist and came up with the design after we discussed the concept and she painted this beauty on my wall. Koi fish with water-the water implies that the koi is swimming downstream, meaning that I have overcome obstacles. Mountains on back of Koi with the sun rising-These are the mountains of Peru, where I have traveled and have a personal connection to them. They are also the symbol of abundance. Feather on the spine-A personal connection with my father and his love of Eagles, we have shared memories between us that have created the backbone of who I am today. Crossed Arrow-friendship, Circle with spokes on inside (Hogan)-Permanent home, Circle with spokes on outside-Happiness, Connected V's with smaller ones inside (Rattlesnake Jaw)-Strength, Thunderbird-Sacred Bearer of Happiness, Symbol for bird (two triangles, a curved line and a circle)-Carefree and Lighthearted, Two nested V's -Thunderbird tracks: Bright Prospects. Such a beautiful and personal meaning for this mural. I think incorporating things like these in a space, adds a wonderful feeling that carries you throughout the day. The green shelves are very useful lined up underneath the inspiration/cork board with lights. The board also hides the cords, because they are plug ins. The lights were to be four, but unfortunately only three arrived and I'm still waiting on the Fourth. It ended up being fine, because with the placement of the mural, I only could really fit three across the inspiration board. Which by the way is just a piece of foam insulation (the kind you get at your local home improvement store) and fabric stapled on it with thumbtacks. The curtain panels, turned out wonderfully with the help of my seamstress. Another great place to sit and work in this space. I tried to create some seating areas to vary the view during the day. The bookcases were given a coat of green lacquer paint, just like the low bookcases on the other side. I'm really thrilled with how this space turned out! Most of the items in this studio were orginal to my old work space. I reused mainly all my furniture. The only new purchases were the lighting, material for curtains, pillows and paint. All in all, it was more labor than money. The work was heavy, the outcome was amazing and now I have a wonderful space to work in! Thanks so much to my husband, who without, I wouldn't have been able to complete this space, as well as my wonderful daughter, Madison, who really put some great personality into the studio with her custom mural! Thank you One Room Challenge and House Beautiful for this challenge that was truly a wonderful way to complete a space in my own home in 6 short weeks. 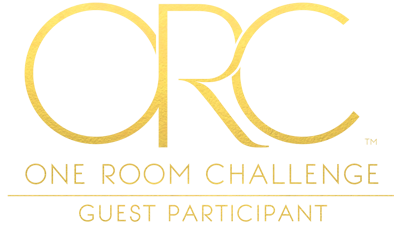 Check out the other final reveals on the One Room Challenge Website.